T shirt marketing is something you see everywhere. One only has to walk down a street in any city to see several custom t-shirts promoting a cause, event, or a business. T shirt marketing is among the most effective ways to advertise if done correctly. We get several calls every day from potential clients who have grand marketing ideas but to no fault of their own they know little about the screen printing process and how custom t-shirts are made. In order for t shirt marketing to be successful it has to be cost effective. To keep custom t-shirts cost effective there are a few factors that come in to play. The biggest determining factor is the quantity, how many custom tees do you need. The more shirts you need the more cost effective they will be. Not only that but with a larger quantity you have more room for creative designs. Don’t get me wrong we have both designed and printed awesome single color t-shirts for clients and we’ve had clients provide us with their own artwork in a single color format that were incredible. However to keep shirts cost effective the quantity of shirts plays a direct role in the number of colors the design can be to prevent them from being cost prohibitive. 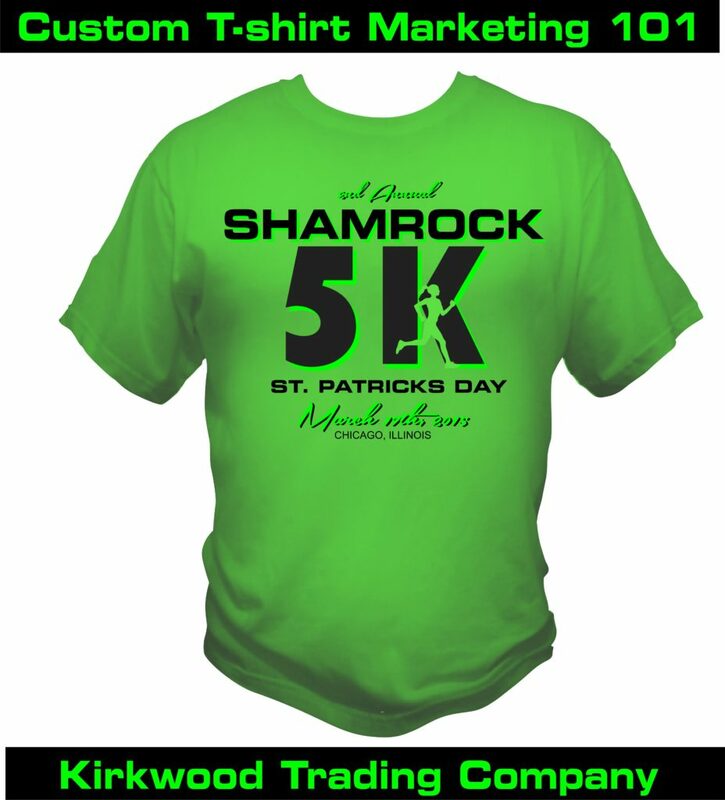 Since we are talking about marketing and profits I’m going to use a 5K run as an example. A client came to use because they hold a huge annual 5K run to raise money for Cancer. They need around 3,000 shirts for the event that go to those who register early. When we first sat down a couple years ago they had an incredible logo that consisted of 6 colors in the design on the front and 4 colors in the design for the back of the shirt. Since they were ordering 3,000 t-shirts they could pretty much have however many colors in the design they wanted and remain profitable. However we looked at the design and noticed that most of the 6 colors were simply there for a wow factor and the number of colors was not paramount to the quality of the design. So we played around with it and gave them pricing on their 6 color front 4 color back design but also showed them their design in a 2 color front 1 color back option and a few options in between. Fortunately the client and the design worked on a 2 color front and 1 color back design. Keeping the back design as a 1 color print was easy, it was simply sponsors logos. The front was easy enough to eliminate 4 of the print colors using shading and halftones to still give the design more depth than the 2 color graphic it ended up being. But what it did was save the client roughly $2 dollars per shirt which equated to $6,000 in savings. They could still sell the shirts to the participants at the same price but now instead of making $8 per shirt they were making $10.00 per shirt. Sometimes when it comes to marketing less can be more not just on increasing the profit but in the design itself. Often times too many print colors muddles up a great design. Keeping it simple means the message is simple and comes across more easily.